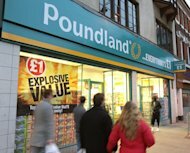 The High Court is due to rule on whether a jobless graduate's human rights were breached when she was forced to work for free in Poundland on a work experience scheme. Cait Reilly, 23, and an unemployed 40-year-old are both challenging the legality of Government work schemes that pay no wages. Both cases seek the quashing of Department for Work and Pensions (DWP) regulations under which the back-to-work schemes were set up. The DWP says the schemes - the Community Action Programme and Work Academy Scheme - are not slave labour but play an important part in giving jobseekers the skills and experience they need to find work. "It is entirely reasonable to ask jobseekers to take real steps towards finding work if they are claiming benefits," the DWP said in a statement. A judge at London's High Court was told by Ms Reilly's QC that the geology graduate's stint at the Poundland near her home in Kings Heath, Birmingham, involved her carrying out "unpaid menial work". This consisted of very basic tasks such as sweeping and shelf-stacking "without training, supervision or remuneration". Nathalie Lieven QC submitted to Mr Justice Foskett: "Such work did not contribute to (Ms Reilly's) search for work to any extent." The graduate had only participated because she was told the training was mandatory and she risked losing her jobseeker's allowance or having it reduced if she did not attend. The second challenge before the court involves Jamieson Wilson, a 40-year-old unemployed HGV driver from the Midlands who has been claiming benefits since 2008. Ms Lieven said Mr Wilson was told last November he would be required to undertake 30 hours' unpaid work a week for up to six months cleaning furniture, and further periods of required work could follow. Ms Lieven said Mr Wilson had recently been subjected to sanctions after refusing to take part in the scheme and now apparently faced the loss of jobseeker's allowance for six months.